in 1895 at Stuart, Guthrie County, Iowa. Charles Clifford was born 13 March 1896. 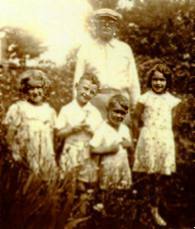 Lawrence Edward was not yet born. 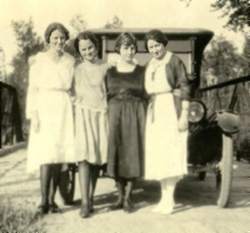 Left to right: Elizabeth Yost, Mary Yost, Jeane Hanson, Alice Yost. 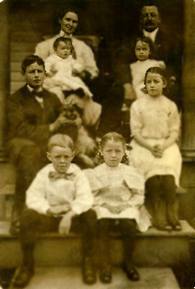 Back row: Elizabeth Hannah (Russell) Yost, William C. Yost, their son Charles C. Yost and their daughter Alice F. (Yost) Diederich. 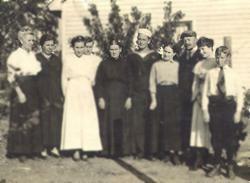 Left to right: first four are unidentified, then, Mrs. Abraham Russell, Charles C. Yost, Mrs William C. Yost, William C. Yost, Alice F. Yost and William Abraham Yost.